SAN ANTONIO (AP) — Gardner Minshew II threw two touchdown passes and ran for another score and No. 12 Washington State stopped No. 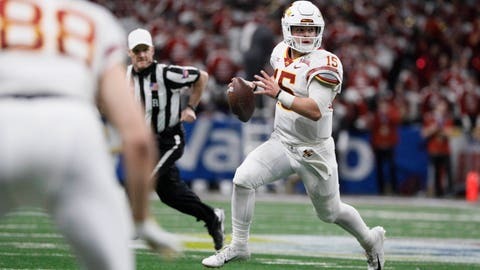 25 Iowa State on a late two-point conversion in a 28-26 victory in the Alamo Bowl on Friday night. Minshew passed for 299 yards to help Washington State (11-2) set a school record for wins in a season. Minshew’s biggest play came out of desperation and it set up the winning score. Iowa State (8-5) rallied from down 21-10 at halftime to 21-20 early in the fourth quarter before running back David Montgomery fumbled on the Cyclones 30. Minshew, who had been held in check in the third quarter, escaped a third-down pass rush to flip a shovel pass that went for 20 yards. The play stunned the Cyclones, and Max Borghi ran in from 10 yards on the next play to put the Cougars ahead 28-20. Iowa State’s last chance came after Brock Purdy scored from a yard out with 4:02 left. The Cyclones went for two, but a pass play was stopped well short of the goal line after a false-start penalty pushed the line of scrimmage back to the 7. Purdy passed for 315 yards and Cyclones receiver Hakeem Butler caught nine passes for 192 yards. Montgomery rushed for 124 yards.